If you don't like meeting people, don't walk from Munich to Venice. If you want to be on your own, prefer solitude, not seeing anyone from dawn till dusk, choose Spain and try the GR1, the subject of my first guide. If, on the other hand, you don't mind bumping into the same people every evening and enjoy engaging with a multi-national community all sharing an ambition to reach the same destination, then you should think about the 'Traumpfad'. I say multi-national but it's fair to say that the majority of people making the trek are German (I hoping my guide will change that). The route was developed by a German alpinist, Ludwig Grassler, and as well as his guide, three others have been published all in German. One of them, with a red cover, is particularly popular, and its schedule is followed by most German walkers. As a consequence, every day throughout the season, a band of walkers leaves Munich, stays in the same accommodation each evening and gets to know each other as they head south. The group of the course evolves as the journey develops. Not everyone has the time to complete a 30-day trek in one go (definitely the best way though if you can) and some slackers avoid the flat bits at the beginning and the end. The 'group' consequently gains and loses members as it moves from hut to hut but despite this, some sort of cohesion persists at least until the last 3 or 4 days on the final approach to Venice. While the majority of hikers will be German, other nationalities feature as well, including the Dutch, Americans and hikers from New Zealand, Australia and Israel (who get everywhere). As well as different nationalities there is typically a refreshing mix of age groups, lots of younger hikers, and plenty of single walkers making the journey on their own. As well as mutual support and problem solving (help with menus, kit and transport options), the group is a wonderful source of entertainment as stories are developed and gossip exchanged. Of course, you don't have to follow the German schedule. 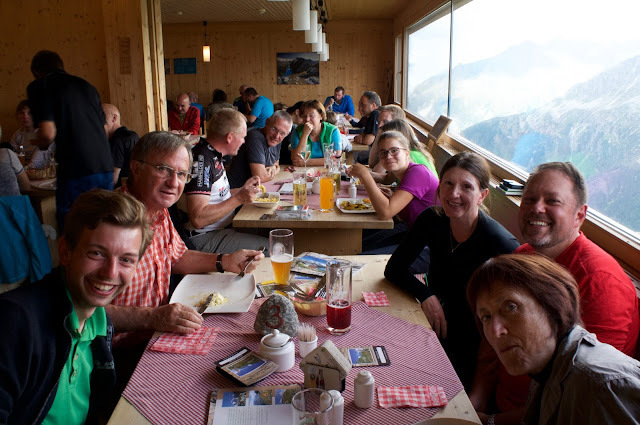 Some people will go further while others will want to avoid the mountain huts and get a decent night's sleep in a hotel. The group, however will there for the duration and whenever you fancy some company and updates on the progress of others, it can be rejoined. I've never walked the Camino de Santiago (the famous Way of St James through northern Spain), thought the scenery was poor compared to the GR1 for example, and always looked down my nose at the rucksacks with their shells attached. I did, however, enjoy the company on the Traumpfad and although I have no intention of walking the 'camino' can understand at least one of its attractions. John, interesting take on communal walking. As you know I do many solitary walks but always enjoy the camaraderie of the Camino or alpine huts. The best of both worlds. May I ask you one question - what is that white 'blob' under Christine's left arm in your second from last photo? Had to do some serious research on that one. After 4 weeks without shopping Christine let rip in Venice. It could have been one of a whole series of items but I think it was a carefully wrapped role of posters. hi John! my name is Eleonora. (I was born in Venice but I live in the US.) I found out about your website this week, while doing some research on the Munich/Venice. I love your enthusiasm and they way you share your adventures. I'm considering to walk the traumpfad this summer and I was wondering: have you ever heard of someone walking from Venice to Munich? I'm fascinated by the idea of walking out of my parents house and just walk to munich. do you think it wouldn't make any sense? would I lose the opportunity of having a more "social" experience? also one last question (maybe you mention this in the guide... I ordered it but I haven't received it yet) do I need to bring along a lot of cash, or huts in germany and Austria accept credit cards? I walked sections of the Alta Via and one of the issues of never going in the villages is that you don't have access to ATMs. Thank you for this beautiful website and the vibrant community of walkers you created! 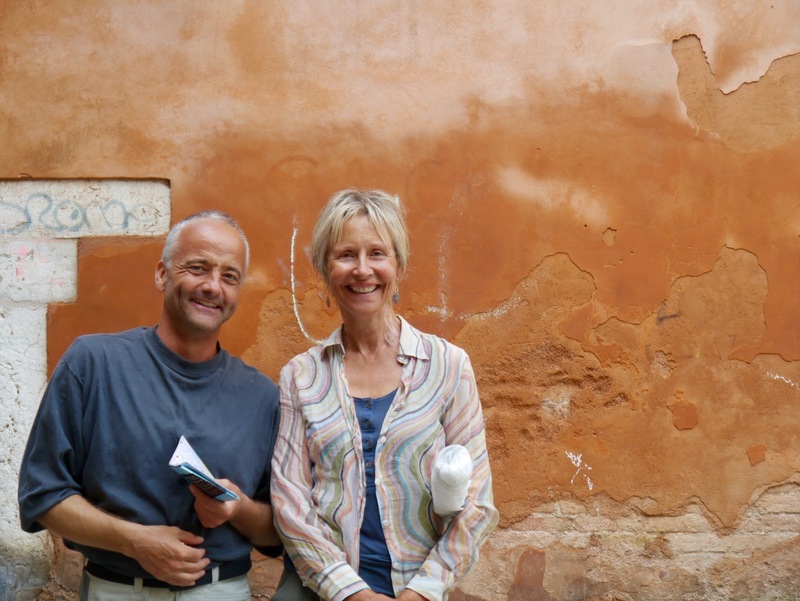 Great questions Eleonara and thanks for your comments about the blog. To be honest I think you would miss the social side of the walk if you started in Venice rather Munich. 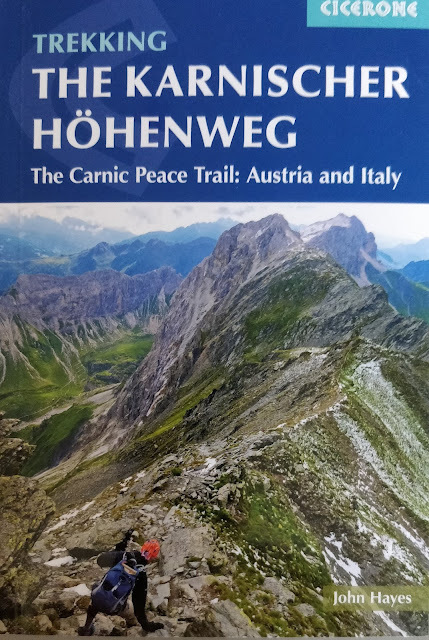 The original idea for the walk is a German one, all the guidebooks other than mine are in German and so far its Munich to Venice rather than Venice to Munich. Trouble is Venice is so much better as a destination than Munich - so much more beautiful. I think you should walk to your parents house and when you arrive have a massive party. Most of the huts do take credit cards but we took cash as well. The guide when it arrives, will tell where the ATMs are. Let me know which way you decide to go, have a great trip and send me some pictures!